Some Western media has been maligning the reputation of the Trump family by publishing distorted reports, like the ones on Ivanka Trump's shoe-making factories in South China's Guangdong Province. Photos in some recent foreign media reports of one of Ivanka Trump's factories in China had led to the dismissal of some workers, as the factory is a legitimate business but foreign reports exposed it as a dark place that allegedly made workers work long hours. The pictures, which were taken by an AFP reporter and had been used by overseas media like thedailybeast.com in December 2016, showed the crowded assembly lines and dark dormitory buildings at a shoe factory associated to Ivanka Trump in China. 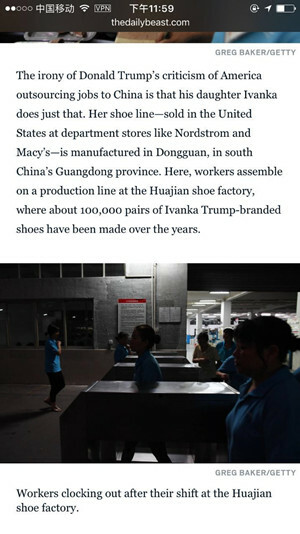 Screenshots of thedailybeast.com that display pictures taken by Greg Baker about the Ivanka Trump's OEM in Guangdong. 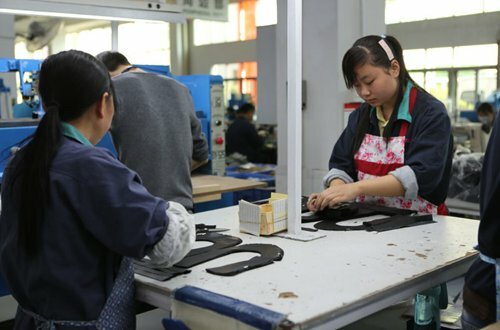 But when the Global Times visited the same factory in Guangdong Province on Thursday, some workers were cutting leather for shoemaking in a bright and airy workshop, a significant contrast with what was depicted in the reports by foreign media. 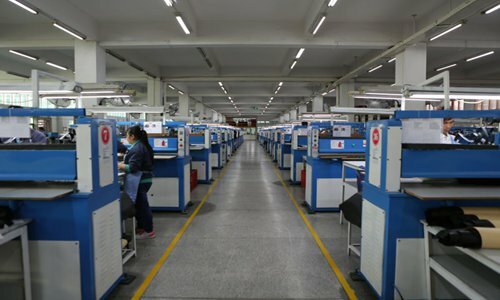 "The reports have deliberately distorted our image as an original equipment manufacturer (OEM), so some workers involved in that reporting and image shooting have been fired," chairman of the factory, who preferred not to be identified, told the Global Times on Thursday. Employees at the factory noted that the foreign reporters trespassed on the factory late in the evening and took some photos in a dark workers' dormitory, where one worker was even half naked. "We respect worker's rights, including providing them meals and allowing them to take rest, but they [foreign reporters] did not report on these aspects," said the chairman who is in charge of the factory. Other reports, like one from the racked.com in October 2016, noted that some of the shoe factories making shoes for Ivanka Trump located in Dongguan required workers to work lengthy shifts that "tested and exceeded the limits of human endurance". That is why some OEMs in China for Ivanka Trump's brand have become much more cautious now on speaking to the media after they reportedly received a notice from their customer. Staff members from two factories based in Guangdong which preferred not to be identified told the Global Times that after the US department store Nordstrom dropped off Trump's products, they got a memo from a China-based agent of the US "First Daughter," notifying that any media reports on her OEMs would not be "good" for her image due to political reasons. In one factory that also produces shoes for big brands like Gucci and Marc Fisher, the director of the board said it has been equipped with automated machines to increase effectiveness. A production line could produce about 1,300 pairs of shoes every day, and work like making a shoe model (cone) and cutting leather can be done by machines but a large part of work is done by workers. To expand its business, the factory has already planned to establish plants overseas, such as in some developing countries, as 90 percent of its products are shipped to the US. "The profit margin of this shoe-making industry is very low, and it is still labor-intensive, so we move to the areas where labor costs are relatively low," he said. Industry representatives said the average ex-factory price for a simple female shoe is about 180 yuan ($26.24), but the sale price for this product could be eight times higher than that. When asked about Trump's claim of moving the manufacturing back to the US, these OEMs said it was very unlikely. "China's Pearl Delta Region is considered as the world's factory, which aggregates many industries in one region," a representative from another OEM told the Global Times on Thursday. "For example, you can purchase any raw materials from leather to ornament in one city here, and you can hire anyone here to do jobs from traditional handcraft shoemaking to electronics equipment," she said, noting that when there is a high requirement for delivery, workers here can work extra time to meet customers' demand. "I don't think workers can be the same in the US," she noted. Sang Baichuan, director of the Institute of International Business at the University of International Business and Economics, said that some overseas media have been paying attention to domestic OEMs for political reasons, such as lashing out at the Trump administration, but their reports can't objectively depict the current situation of domestic OEMs. He also noted that domestic OEMs are improving significantly in areas such as labor treatment as China undergoes industrial upgrade. "OEMS are a result of international labor division. China's OEMs have a particular advantage for their good quality, reasonable price and mature workers, and have brought profits for overseas countries like the US. I don't think it is right to completely ignore the values and contributions of those companies," he noted.